The Lumens PS660 SXGA desktop visual presenter offers one-touch integrated audio and video recording, HDMI interface, and SDHC support. The presenter has a large capture area and includes features such as HD 1080p resolution and the ability to store 240 images internally. 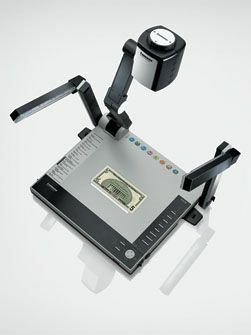 The teacher can use the PS660 to show a class details that are too small to see, or to compress or expand time. Since the PS660 integrates with most interactive whiteboards, labeling of images and saving of lessons is no problem. Because it records to a standard SD memory card, teachers can save prerecorded lessons to play back at a later date. Pros: The presenter has full integration with interactive whiteboards and built-in audio and video recording. It records to a standard SD memory card, and has a 15X optical zoom with auto focus at end of zoom. The HDMI output at 1080p allows direct connection to high-definition media sources with one cable. The software has TWAIN/WIA support for both PC and Mac. The large capture area has more than enough lighting. The controls are well labeled and easy to use. Recording (audio and video) is done with the touch of one button (the presenter does not have to record from an attached computer like many of the competitors). Overall Impression: The PS660 is a little pricier than some of the other visual presenters on the market, but the features make it worth the price. An experienced user would make good use of the extended features such as the HD output and the recording to the SD memory card. Perhaps the most impressive feature is the ability to do both audio and video with one touch.